I am not Stephen King’s Number 1 Fan - that’s a title that belongs to Annie Wilkes of “Misery” (1987) so adeptly played by Kathy Bates in the 1990 movie. I have, however, been a Constant Reader since the summer I was 13, when in one week of late nights and heat lightning, I discovered “Carrie” (1974), “The Shining” (1977) and “Night Shift” (1978). I’ll read anything he’s written and watch most movies, although I think most of his work is best adapted as a miniseries. 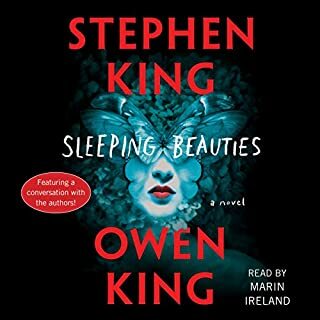 I don’t know Owen King’s work as well, but Stephen does well with co-writers - “The Talisman” (1984) with Peter Straub was wonderful, so I was looking forward to listening to “Sleeping Beauties” (2018). It’s more than a 25 hour listen and it is 736 pages in print. There’s an Easter egg on the Audible - an recorded interview with both Mr. Kings - so it’s a lot for your Audible credit. The town “Sleeping Beauties” was set in - Dooling - was vividly imagined. On Audible, it’s pronounced ‘dueling’ which gives it a whole different meaning. I ended up with a very detailed mental map of the Dooling Correctional Facility and the town that it supported and that supported it. I could even feel the weather. The characters were well created, carefully considered, and there wasn’t a trope among them. Evie, the mysterious stranger who holds the key to so much destruction, is fascinating. I think she might be a cousin of “Rose Madder” (1995). The woman sheriff and warden are the kind of people you trust and respect, and there’s no condescension in any work they do and no stereotyped descriptions. However, there were so many characters - particularly among the women inmate characters - that I mixed them up. Several times, I found myself bewildered by the reintroduction of someone I didn’t remember. Maybe it wouldn’t have happened if I had listened to the book straight through, but I didn’t. “Sleeping Beauties” didn’t hold my interest steadily, so I Interrupted it for other books. The premise was interesting - what if every woman went to sleep and couldn’t be woken up? - but the plot involved too much suspension of disbelief, even for someone who’s been suspending disbelief and enjoying Stephen King’s books for decades. The performance by Marin Ireland was something else, though. It was so well narrated that I wondered if it had been written with her in mind. It is entirely possible - the book started out life as a teleplay. The book was dedicated to Sandra Bland, a young Black woman who committed suicide in jail shortly after being arrested without a good reason. The title of this review is a quote from the book, which is itself a quote from the 2017 US Senate censure of Senator Elizabeth Warren. Yes, this is the book that the 1997 Paul Verhoeven film “Starship Troopers” is (very loosely) based on. The major characters have the same names. There’s Mobile Infantryman Johnny Rico, Pilot Cadet Carmen Ibanez, and MI Platoon Leader Lt. Jean Rasczak. The enemy is still Arachnids, and Bugs are a relentless killing machine, driven by a hive mind. The mission is to find the bug brain. 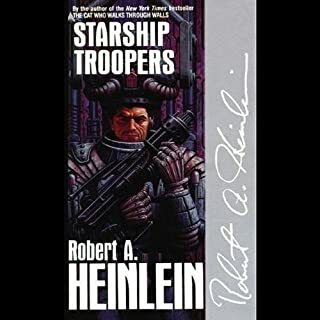 However, Robert Heinlien’s book “Starship Troopers” (1959) is not fantasy SciFi with sculpted 20 somethings on a jaunt to save Earth. I haven’t been able to confirm that it’s actually on the reading list for West Point or any other service academy, but it wouldn’t surprise me if it was. It’s a huge bundle of combat command theory and best practices wrapped into lively military science fiction. Some of the theories and techniques Mr. Heinlein explored more than half a century ago were well established then and are still in use now. I’m an enlisted military veteran and recognize what he describes. Parts of the book are jarring for other reasons. In real life, Mr. Heinlein was a proponent of both nuclear energy and nuclear arms. At one point, the book has a brief discussion about how the inhabitants of another planet are disadvantaged because they are not exposed to radiation and do not have genetic mutations. That was disconcerting. The narration sounded a little older than the characters, but it was a good listen. I listened to James Comey’s “A Higher Loyalty: Lies and Leadership” (2018), and then former Director of National Intelligence James Clapper’s “Facts and Fears: Hard Truths from a Life in Intelligence” (2018). I wanted more historical context for what was in the book, so I looked for news articles. This article talks about the FBI in the weeks before the election and the fact that Mr. Comey probably swung the election. 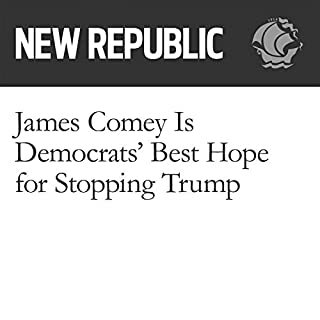 The New Republic thought he would stand up to President Trump. July 24, 2015 - the FBI opened an investigation into Secretary Clinton’s use of a private email server. October 28, 2016, Mr. Comey reopens the FBI investigation. November 6, 2016, Mr. Comey announces that Secretary Clinton will still not face charges and closes the investigation. November 8, 2016, Donald Trump is elected president. May 9. 2017 - Mr. Comey is fired. 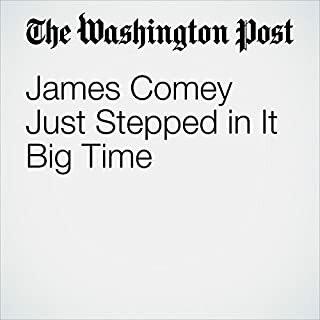 "James Comey Just Stepped in It Big Time" is from the May 09, 2017 Politics section of The Washington Post. It was written by Aaron Blake and narrated by Sam Scholl. I just finished former Director of National Intelligence James Clapper’s “Facts and Fears: Hard Truths from a Life in Intelligence” (2018). He concludes Russian interference in the election cost former Secretary of State Hillary Clinton the 2016 presidential election, especially after the FBI investigation into her emails hacked by Russian operatives was made public. Before that I listened to James Comey’s “A Higher Loyalty: Lies and Leadership” (2018). I wanted more historical context for the events, so I looked for news articles. July 24, 2015 - the FBI opens an investigation into Secretary Clinton’s use of a private email server. If Republicans had any remaining excuses for not investigating the relationship between the Trump presidential campaign and Russian officials, Tuesday night’s news obliterated them. “Phone records and intercepted calls show that members of Donald J. Trump’s 2016 presidential campaign and other Trump associates had repeated contacts with senior Russian intelligence officials,” reported the New York Times. “Among several senior Trump advisers regularly communicating with Russian nationals were then-campaign chairman Paul Manafort and then-adviser Michael Flynn,” said CNN. 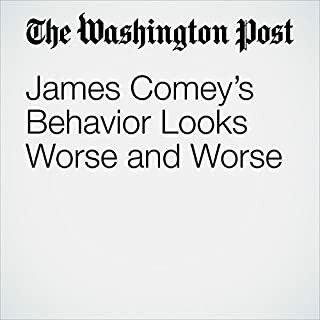 "James Comey’s Behavior Looks Worse and Worse" is from the February 15, 2017 Opinion section of The Washington Post. It was written by James Downie and narrated by Sam Scholl. I just finished former Director of National Intelligence James Clapper’s “Facts and Fears: Hard Truths from a Life in Intelligence” (2018). He concludes Russian interference in the election cost former Secretary of State Hillary Clinton the 2016 presidential election, especially after the FBI investigation into her emails hacked by Russian operatives was made public. 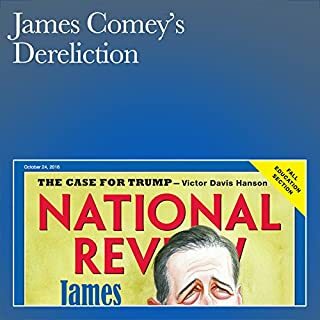 Before that I listened to James Comey’s “A Higher Loyalty: Lies and Leadership” (2018), who claimed moral rectitude meant he had to discuss Secretary Clinton - but not an ongoing concurrent investigation into Donald Trump’s campaign’s cooperation with Russia. I wanted more temporal context, so I went looking for news at the time. WaPo is right. It looked bad when this was written, and it got worse. May 9. 2018 - Mr. Comey is fired. The Attorney General Could Have Ordered FBI Director James Comey Not to Send His Bombshell Letter on Clinton Emails. Here's Why She Didn't. Twelve days before the presidential election, FBI Director James B. Comey dispatched a senior aide to deliver a startling message to the Justice Department. Comey wanted to send a letter to Congress alerting them that his agents had discovered more emails potentially relevant to the investigation into Hillary Clinton’s private email server. I just finished former Director of National Intelligence James Clapper’s “Facts and Fears: Hard Truths from a Life in Intelligence” (2018. He concludes Russian interference in the election cost former Secretary of State Hillary Clinton the 2016 presidential election. Before that I listened to James Comey’s “A Higher Loyalty: Lies and Leadership” (2018). I got curious about what the papers were saying as things happened. Sure, I was reading papers obsessively at the time, but it was overwhelming. 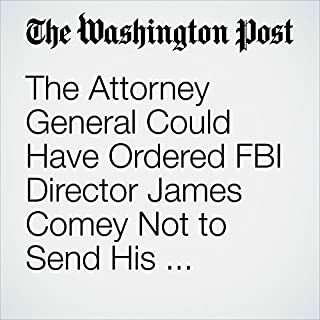 This article is a more in depth discussion than either book about the decision about why former Attorney General Loretta Lynch did not stop Mr. Comey from releasing statements about Secretary Clinton. In the wake of Hollywood’s Harvey Weinstein scandal, countless women across the world have stepped forward to share their stories of sexual abuse and harassment. "Carrie Fisher's Gross but Supremely Satisfying Warning to a Hollywood Sexual Harasser" is from the October 17, 2017 Entertainment section of The Washington Post. It was written by Kyle Swenson and narrated by Sam Scholl. The hashtag metoo movement lost one of the best advocates when Carrie Fisher (1956-2016) died. Ms. Fisher was was a good actress (“Star Wars” (1977) etc. ); an amusing biographical novelist (“Postcards from the Edge” (1987); and a great memoirist and humorist (“Wishful Drinking” (2007) and “The Princess Diarist” (2016)). As this piece describes, Ms. Fisher was matchless at sending a message to would-be rapists. I’d really like to know who Ms. Fisher presented the Tiffany Box to. 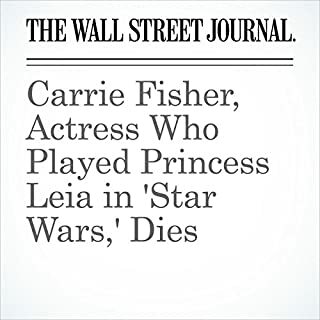 "Carrie Fisher, Actress Who Played Princess Leia in 'Star Wars,' Dies" is from the December 27, 2016 World section of The Wall Street Journal. 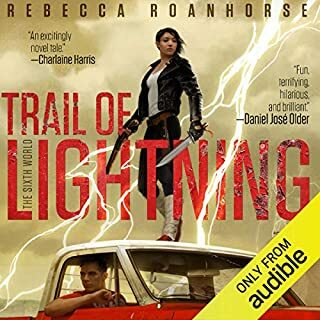 It was written by Erin Schwartzel and Tamara Audi and narrated by Fleet Cooper. I was looking for an Audible version of “Postcards from the Edge” (1987) by Carrie Fisher (1956-2016). I did a search on her name, and this lovely obituary showed up. It’s well worth the listen. Of course the Obama administration was not going to prosecute Hillary Clinton. Listen for context and content, but . . .
Andrew C. McCarthy’s piece is a good reflection of how conservative America was feeling in the two weeks before the 2016 presidential election. I can’t decide who Mr. McCarthy hated more: FBI Director James Comey, who he had worked with in the past; or former Secretary of State and presidential candidate Hillary Clinton. The FBI opened an investigation into Secretary Clinton’s use of a private email server on July 24, 2015. FBI Director James Comey announced the investigation was being closed without charges against Secretary Clinton on July 5, 2016. On October 28, 2016, 4 Days later, Mr. Comey reopened the FBI investigation. On November 6, 2016, Mr. Comey announced that Secretary Clinton would not face charges. On November 8, 2016, two days after that, Donald Trump was elected president. As former Director of National Intelligence James Clapper concludes in “Facts and Fears: Hard Truths from a Life in Intelligence” (2018), Comey’s actions exacerbated the confusion and misinformation peddled by Russian intelligence, and Russian interference cost Mrs. Clinton the presidency. As enlightening as the piece is, I was completely distracted by Mr. McCarthy’s “analysis” of negligence. Mr. McCarthy mixed up and misapplied elements of simple negligence, gross negligence, statutory negligence, negligence per se, criminal negligence, federal and state laws, and randomly tossed in mens rea. I expected more. The narration was also a problem - the Latin phrase “Mens rea” (guilty intent) is not usually pronounced so it rhymes with “diarrhea”. “Rea” is pronounced Ray-a.